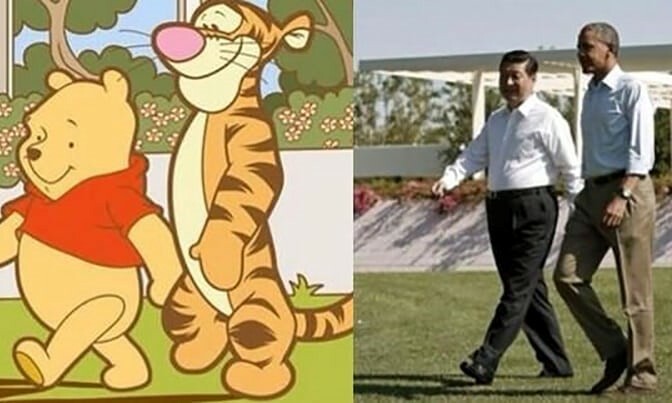 Memes likening Xi to the portly Pooh have become a vehicle in China to mock the country’s leader"
To think he’s mocked in jibe and jest. Tigger and Pooh were swiftly banned. We cannot have lèse majesté. That banning thing’s a sign of strength! You're on a roll, Mr Drew! Thanks to all at C@W for some outstandingly clever posts during this silly season. Top work, I can't stop snigering to the bemusement of my colleagues! Very good. In Britain we'd be banning letter boxes right now, wouldn't we. My secret for waistline management is NEVER UPSIZE YOUR TROUSERS. Stop eating and start moving if things get a bit tight. For the older gentleman I can recommend a Bullworker Steelbow (or an old X5) and a bit of jogging, working up to 15 minutes (including 3x 20second sprints, or as best you can) on the days in between. Never more than 20 minutes a day, never less than 10. No excuses and the results are beyond belief. Very good except that he last line doesn't scan. I suggest: "That banning is a sign of strength." Err - how many syllables in "is"? And now ... how many in "thing's"? I'd offer my services as President Xi's personal trainer. A sign of strength is a six pack and a pair of guns. Instead of looking like he's holding a barrel out front he'd look like he's carrying a carpet under each arm. I'd leave the power pose training to Sajid Javid. Together we'd restore Xi's self esteem in no time at all. The cover of Men's Health beckons and we could release the Pooh. I never used to care about people's weight as I was a chubby nerd for most of my life but it's increasingly clear to me that fat people are stupid. The obese leader of a superpower is scared of Winnie the Pooh memes. Every day I see overweight hyper-consumers claim to be a anti-capitalist environmentalists. Even physicists suddenly become anti-science when you tell them that conservation of energy applies to their bodies. Nick -- just say that last verse out loud. Scansion depends on stresses, not counting syllables; and to bring "thing" into the line, you have omitted "a", so the grammar is dodgy too. What a civilised blog this is! Thats a corset he's wearing, or I'm a chinaman. "... it's increasingly clear to me that fat people are stupid." "Da Kay Eff Seee famleee boocki' - Fah pisses a' chikkin wi' fraas 'n' biiins. Six niney naaaan ! Yeah !" Bang goes the national IQ. No. People who eat KFC are stupid. And that Col Saunders' 'secret' recipe ? It contains asbestos, clearly. The KFC is about the only thing left standing after a weekend of rioting.